After yet another week of unseasonably cold weather here at Loch Leven, it thankfully looks as though we might finally be due a spell of warmer weather this week which should hopefully see the water temperatures rise. Last week it had actually dropped back to 9.50C which we cannot recall being the case before in mid May! The clarity of the water is now 2.9 metres and weed growth is now underway in all the areas of the loch where we would normally expect it. Buzzers are still seemingly slow to hatch but some were seen on Saturday evening. The two clubs out that evening reported seeing some fish on the surface and indeed a few were caught in spite of the very cold air temperature. Pulling methods with a variety of line densities are probably the best tactic at the moment although buzzer tactics are proving successful and will probably become increasingly effective as the water temperature now rises and the fish feed on the sub surface hatching buzzer larvae. The open water drifts of the North, Elbow, Mid & East buoys are all producing fish, mainly to pulling methods. The Hole ‘o’ the Inch is still working well using buzzer methods and this was where Andrew Scobie caught a lovely 6 lbs 8 ozs brownie on Sunday (see photo). Brock’s Hole, North of Castle Island and Roy’s Burn (Fishponds) have also been mentioned over the past week. Including this fine specimen, Andrew Scobie and Rod McLellan had 6 fish in total on Sunday, all of which were released. Dave Clark also returned 6 fish and kept one weighing 4 lbs 5 ozs. Bill Taylor had a nice fish weighing 4 lbs 12 ozs and Lindsay Barrie had 4, all returned. In terms of the clubs, a Kinross AC outing (6 boats) had 31 trout in total of which 27 were returned. The Grizzlecats had one at 3 lbs 8 ozs plus 16 returned. Kelty Artisans with 4 evening boats had 9 fish for 10 lbs 8 ozs and Dunfermline Railway AC, also with 4 evening boats, had 7 fish for 7 lbs 8 ozs. Fly patterns are not changing a great deal. Size 12 traditional wet flies are working, especially the Dunkeld, Doobry, Kate McLaren and all the Snatchers. Buzzers are much the same but anglers need to take a bit of care about the size they choose – sometimes the trout will take up to size 8 on occasion but it will depend largely on what is hatching or active way below the surface. Evening fishing should now start to pick up as the weather warms and some anglers have actually already had some evening success despite the erstwhile unfavourable conditions. 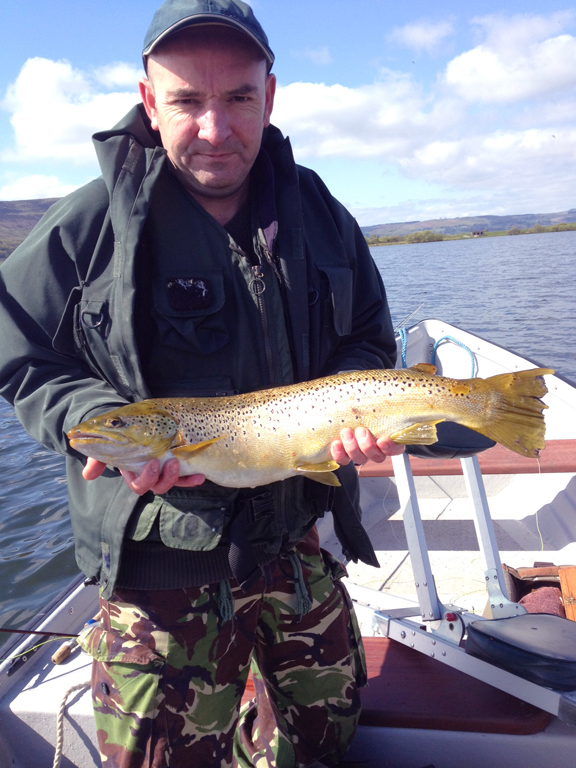 This entry was posted in Fishing breaks, News, Reports and tagged angling loch leven, angling perthshire, brown trout, fishing breaks loch leven, fishing loch leven, fishing report, game fishing loch leven, game fishing perthshire, Loch Leven, loch leven angling, loch leven fish, Loch Leven Fishing Report, Willie 'the Ghillie' Wilson, Willie the Ghillie. Bookmark the permalink.